Mental Health in the UK affects around one in four people at least once in their lifetime – however, despite so many people suffering the effects of poor mental health, it is one of the most widely misunderstood aspects of our health. 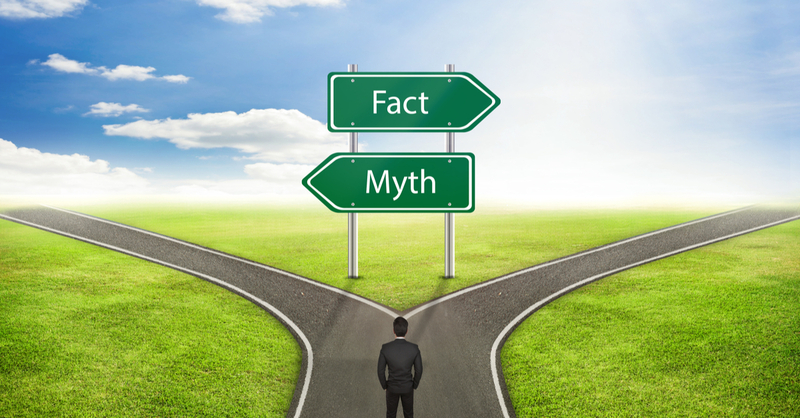 In this article we discuss the myths and facts about mental health. There are many possible reasons as to why we have so many misconceptions about mental health – from the way it is depicted in films and television series, to the way we discuss it with our friends and colleagues – however as more of us open up about mental health we open up to opportunity to correct the misunderstandings. Until very recently it was considered taboo to discuss mental health within most social circles in the UK, however – perhaps due to the recent awareness campaigns – mental health has become a lot easier for most people to talk about, to seek help for and to educate ourselves about. Mental health conditions can strike anyone at any time throughout their life, from young children to the elderly and with men and women both being at risk. Having a general understanding of mental health can help us to be more understanding if a friend or loved one finds themselves struggling, enables us to spot the signs in ourselves and in other people and encourages us to be more mindful in day to day life. But what are the biggest misconceptions – or myths – about mental health? Many people consider mental health illness to be a rare occurrence, with a very small percentage of the population suffering from poor mental health. However, in the UK one in four people struggle with their mental health and suicide is the most common cause of death for men aged 20-49 years in England and Wales. Another common misconception about mental health, is that once you’ve suffered with mental illness – whether it be depression or post-traumatic stress disorder you will never recover or get back to your normal life. However, with the right support and plan in place it is possible to completely recover from a mental health condition and live your life as you did before you suffered ill mental health. Equally, suffering from post-natal depression with your first baby doesn’t mean you definitely will with your second, despite what the media often displays. Mental health is often – wrongly – considered a sign of weakness especially for the older generations. However, poor mental health can strike anyone at any time – despite their background, job history or financial stability. In the same way that a broken arm or a viral infection doesn’t make us weak, neither doesn’t poor mental health – it is simply an illness that can affect anyone. Mental health illness is commonly considered an adult’s problem, however in the UK around one in 10 children suffer from ill mental health with numbers rising year after year and around 70% of mental health problems in adults are thought to have begun during childhood or adolescence. The youngest generation’s relationship with social media is thought to be behind the rise in mental health problems in teenagers and young children causing an on-going mental health crisis amongst young children in the UK. Commonly – particularly in previous years – mental health problems were often considered a problem that only those who are less well-off will experience, however, mental health can affect anyone at any time. Whilst finances and financial stability can play a role in your mental health conditions – particularly with illnesses such as depression – they are not the reason behind mental health illness. The recent increase in number of celebrities speaking out about their own experiences has only highlighted the fact that you can experience ill mental health, regardless of your income or financial position. A number of different mental health conditions have long been associated with violence – perhaps due to the way mental health is often depicted in films and television series. Schizophrenia in particular is often misconceived as a violent mental illness, however very few sufferers are violent – in fact, those who suffer with poor mental health are more likely to be the victim of a violent crime, rather than the perpetrator. For those who don’t suffer with their mental health, understanding that others can’t simply “snap out” of their “bad mood” as easily as they can, can be difficult to fathom as they have never experienced the grip of mental illness. Whilst mental illness can be overcome, with suffers often making a full recovery through the right treatment, it is not as simple as snapping out of a bad mood – and equally suffering poor mental health is not a choice, similarly to how catching the flu is not a choice. If you think you could be struggling with your mental health speak to a professional to work out the best way to move forward. Online therapy could be a great way to help you get back on track and feeling like yourself again. Unlike with traditional therapy clinics, online therapy can be practiced from the comfort of your own home at a time that suits you – without compromising on the therapy itself. If you think online therapy could benefit you, or a loved one, why not visit our site to learn more about how online therapy works and the selection of therapies we offer to cover a range of mental health conditions.